Plot Summary: Three newcomers join the Etiquette club rather than the popular Debutante Club and soon discover its members are part of a secret task force called Exters. 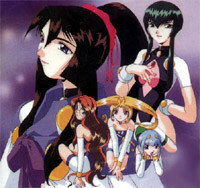 Fan service is a predominated feature in the transformation sequence. One-shot compilation of the three-episode OAV series. Based on a short-lived toy line by Tomy.